Volume 16 of Transaction's acclaimed Rutgers University Studies in Classical Humanities series, continues the work of Project Theophrastus on the School of Aristotle. 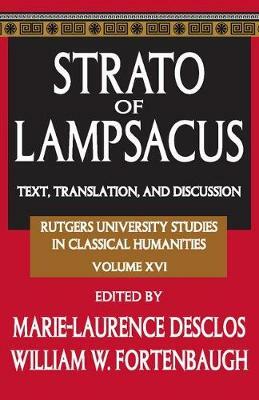 The subject of this volume is Strato of Lampsacus in Mysia on the Hellespont. Strato was the third head of the Peripatetic School after Aristotle and Theophrastus. He succeeded the latter in c. 286 BCE and was in turn succeeded by Lyco of Troas in c. 268. Diogenes Laertius describes Strato as a distinguished person who became known as "the physicist," because more than anyone else he devoted himself to the careful study of nature. Strato's concern with the physical world is well attested by the titles of his books: On the Void, On the Heaven, and On the Wind. His other books point to a keen interest in human physiology, animal life and diseases. But it would be a mistake to think that Strato was uninterested in other areas of philosophic concern. Indeed, he wrote works on logic, first principles, theology, politics and ethics. None of this work survives intact, but the reports that have come down to us reveal much of present-day interest. Included is a new and complete edition of the ancient sources, together with a critical apparatus to the ancient texts, an English translation, and notes to the translation.